I am chipping away at my TBR (to be read) pile. Will I ever completely finish said pile? Highly doubtful. In any event, I was stoked to find yet another new paramilitary action novel available as an e-book, and set in a rather fascinating part of the world. 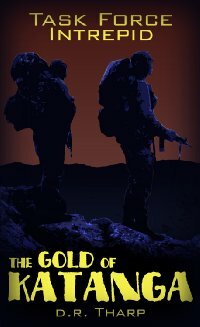 Ironically (because I reviewed Dark of the Sun not long ago) there are strong similarities in Gold of Katanga to the Wilbur Smith novel originally titled Road to Katanga: Both are about white mercenaries operating in the Congo, in Katanga Province, and involve missions to rescue missionaries. With those ingredients for a shoot 'em up adventure in common, each chef diverges into his own recipe (as they must, since the respective time periods are 50 years apart and the conflicts significantly different). Dan Tharp's military experience was in the Navy, yet his research was obviously dilligent. His depiction of land-bound operators is plausible, as is his African backdrop. Where he really hits his stride, though, is during the action sequences. I regret I was unable to read this book in a couple sittings. More like 250 mini-sittings. That's no way to read a book. Still, this is a promising kickoff to a new paramilitary series in the tradition of The Hard Corps and Soldier for Hire (also somewhere in my towering TBR pile), if not Able Team and Phoenix Force. Task Force Intrepid is not a government-sponsored secret team of shooters, but a Private Military Company. An altruistic PMC, of course. Rest assured that moral ambiguity was not a goal of the author's, so you will have no trouble distinguishing who to love and who to hate. US-based (but Afrikaaner-led) TFI's mission is to recover a couple gold mines captured by the bad guys. An additional objective is later added to rescue what is left of a missionary group now hostages of a cutthroat jungle gangster. The plot and themes are timely; the technical details are well-researched, and the action flows like blood from a major artery. Stalwart men's adventure, here. Looking back over January, it seems I inadvertently turned it into Military Month. The military is where I came from and a large part of who/what I turned out to be, so I suppose it's natural this sort of thing can happen without conscious effort. But let's set the record straight: the Two-Fisted Blog is not just about the Armed Forces and/or war. I blog about violence, mayhem and fiery explosions in civilian contexts, too. The missus picked out Real Steel at Redbox thinking that both our four-year-old and I would like it. She was right about that, but didn't anticipate how much she herself would enjoy it. I watched it once with them and they watched it twice more while I was at work the next day. And she doesn't normally watch movies more than once. So right there I can dub this a fine selection to watch with the family. While the plot unfolded on screen, I couldn't help comparing this flick to an old Twilight Zone episode about boxing robots. It turns out I had also read the source material from which that episode was adapted: a short story titled Steel. In it, the sport of boxing has become all about fighting robots. The protagonist, a manager with an old clunker robot, decides to fight in its stead when the old rattletrap breaks down for the final time. Sure enough, a quick Bing search revealed that this movie was indeed inspired by that story. But the adaptation was loose. There were superficial changes, such as the boxers were huge robots that could in no way be mistaken for human beings. But more characters and themes were introduced as well. There was a tiny romantic subplot that your significant other might appreciate. But the main theme had to do with a deadbeat dad who gets a second chance to be a father to his abandoned son. There's no danger of an Academy Award nomination, here, but it's a worthwhile family bonding opportunity. Also, there are suggestions that the sparring 'bot is sentient, but that's never completely established. One of my coolest Christmas gifts ever as a boy was Rock 'em Sock 'em Robots. When I saw the trailer for Real Steel, I initially thought this was another Hollywood fluff piece based on a toy (or a videogame, though I don't know if there ever was a videogame version of RSR). Even so, it looked cool. And I suspect RSR was an influence for the film makers. Also the familiar impossible underdog theme used to such popular effect in Rocky I and other jock movies (Mystery, Alaska comes to mind). You not only get to see robots fighting each other, but also a robot fighting a 2,000 pound bull. Tell me that's not worth a buck and change at Redbox. Americans love a great comeback story, don't we? Whether it be John Elway, Sugar Ray Leonard, Frank Sinatra, Douglas MacArthur, Superman II or Rocky III, we're all suckers for heroes who suffer reversals but come back swinging. Heck, Arnold Swarzenegger's superstardom began the moment he uttered "I'll be back" from the silver screen. As a Special Forces officer in Vietnam, Jim Morris suffered a significant setback in the form of a combat wound which forced his retirement. But that didn't keep him away from Indochina or from the Montagnards he'd lived, fought and trained with so extensively--he returned as a war correspondent. In fact, he covered several Third World hot spots after that. And lucky for literate, red-blooded males, he began writing books, too. War Story, The Devil's Secret Name and Fighting Men earned him the respect of servicemen, veterans and lifelong civilians. He wrote some dang good fiction, too. Time marched on. Books went out of print. Self-appointed soothsayers in the publishing industry decided for us what we were willing to read...and it wasn't the kind of books Jim Morris wrote. Oh yeah--there was also a movie called The Rookie which helped supplant the identity of the man associated with that name in the popular consciousness. Time kept marching. As tends to happen, changes in technology and culture take place. First came POD publishing. Then e-publishing. Then the Two-Fisted Blog! Maybe not in that exact order, but the point is, some great books and great authors will be fighting their way back into the literary landscape. 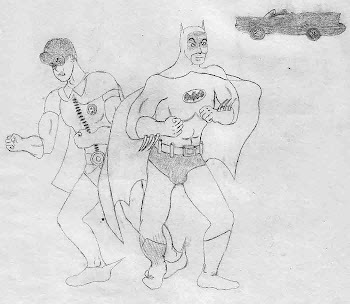 I've already got some teasing tidbits on my Virtual Pulp Press site, while more and better morsels are in the works. Jim's got some great stories to share, both within and without his books, and I'll be passing some of them along in months to come.